This condo is located in a small, newly renovated 5 unit complex on the canal, which offers a private and peaceful setting, yet only a 5 minute walk to the beach and most tourist attractions. 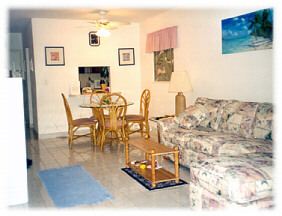 It makes a great vacation home for couples or entire family - affordable, comfortable, spacious, and nicely decorated. Fully furnished and equipped. 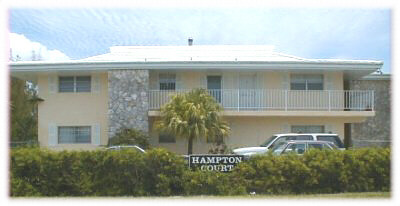 Hampton Court #3 is located on the first floor of a 5 unit complex on the canal. 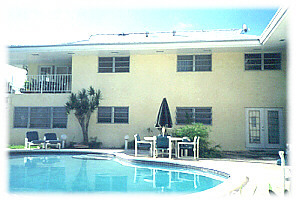 Private pool for residents is just steps away from the back door. 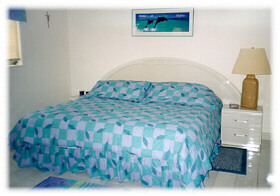 2 nicely sized bedrooms with large dressers, alarm clocks, and extra linens. L-shaped sleep sofa in living room. 2 full baths - one located in master bedroom and the other in the hallway of the second bedroom. All towels provided, including hand and face towels and beach towels. Kitchen is fully equipped - toaster, blender, coffee maker, electric can opener, pots, pans, baking pans and dishes, tupperware, dishes, cups, coffee mugs, wine glasses, tea pot, plastic pitchers, cooking utensils, silverware, pot holders, and more. 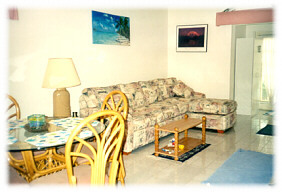 Living room with comfortable L-shaped sleep sofa, cable TV, VCR and movies, stereo with tape and CD player. Unit is fully furnished and nicely decorated. Many newly released movies on VCR tapes. Extra linens, blankets, pillows, and beach towels provided. A short 5 minute walk to the beach, restaurants, new hotel strip, shopping, strawmarkets, drugstore, souvenir shops, nightlife, watersport activities, diving, dolphin experience, booze cruises, snorkeling trips, and more. 10 minute walk/3 minute bus/taxi ride to the grocery store. Public bus stop and a professional golf course directly across the street. 10 minute bus/taxi ride to the casino. Washer and dryer on premises - just a door away. Phone available for local outgoing calls, incoming from anywhere. Other activities/entertainment: A 5 minute walk to Port Lucaya which provides free nightly entertainment. Day and evening boat cruises, booze cruises, kayaking tours, jet-ski rentals, para-sailing, UNEXSO (Diving and Dolphin Experience). $100.00 one time charge for the cleaning fee. Rates increase by 20% during the Christmas and New Year holidays. 50% rental deposit made with cashier's check required to secure dates. Balance payable in cash or traveler's check at check-in.